The United Nations Academic Impact (UNAI) and Millennium Campus Network (MCN) are pleased to announce a strategic partnership to convene, challenge, and celebrate student leadership advancing UN goals. Building on their combined 17 years of experience engaging institutions of higher education, MCN and UNAI are partnering on the Millennium Fellowship. The program is free and the application is open to undergraduate students in good standing. Student leaders who are making positive impact in community and advancing the 2030 Agenda for Sustainable Development and the ten principles of UNAI are encouraged to apply. Between admission in August and conclusion of the program in December 2018, cohorts of Millennium Fellows will convene locally on their respective campuses at least monthly to engage in the leadership development program. Fellows will be challenged by Campus Directors to share best practices and take collective action on one or more of the Sustainable Development Goals. Upon successful completion, each Millennium Fellow will receive recognition of completion for their Millennium Fellowship Project from MCN and UNAI. Together, MCN and UNAI are catalyzing a new generation of ethical leaders committed to strengthening communities and advancing UN goals. Step 1A Apply (as soon as you can) to become a Millennium Fellow. Step 1B. If you want to curate the Millennium Fellowship on your campus, in your Fellowship application you can also apply to be one of two Campus Directors for your Campus Hub. Note on deadlines: The general application deadline to apply for the program is May 31. 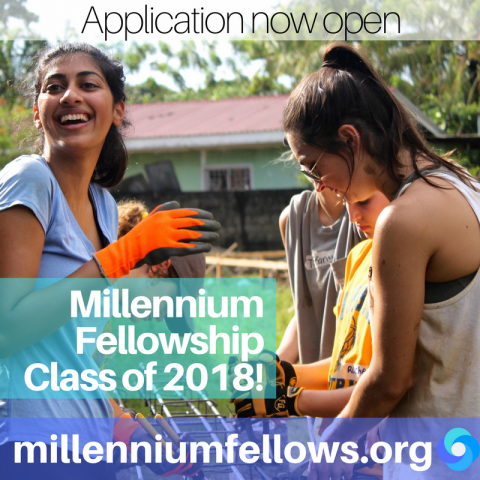 The final application deadline for the Millennium Fellowship Class of 2018 is July 15th. All Millennium Fellows and Campus Directors will be announced by August 15th. Please note that this is a selective program – while there is remarkable student leadership in every community, in 2018 we can only select a small percentage of all applicants. Previous articleWorld Youth Alliance Africa 2018 Internship Program Batch 3 for Young People. Hi my name is ramatoulie jallow from Gambia. I would love to have any email you post about opportunities for africans. Thanks. Hi, my name is Foday Sekou Kamara , from the Republic of Liberia. I found this source very important for me and l would be very glad to have email regularly from post to keep me posted for any events or opportunity for Africans.